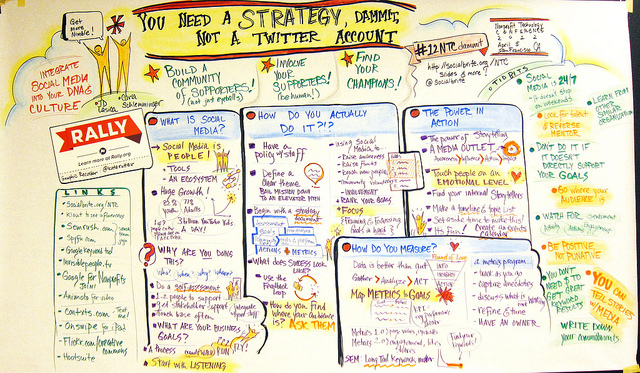 The graphic recording created during Socialbrite’s “You Need a Strategy” session at the 2012 Nonprofit Technology Conference. Here’s our roundup of conferences in the nonprofit and social change sectors coming up in 2013. This has become an annual tradition here at Socialbrite, and we hope you’ll bookmark this page and return to it throughout the year — we’ll be updating it throughout 2013 as more conference details firm up. I‘ll be one of the speakers at Media2Movements, a gathering in Miami on Wednesday that will focus on the escalating changes in the mediasphere. We are at a catalytic moment: Rapid technological change and entrepreneurial innovation have brought us closer than ever to full information citizenship. Egypt, Libya, even Wisconsin testify to the growing capacity of media to catalyze movement; change happens when people know what’s going on and can tell others. But those same forces also threaten the public good by corroding the historical values of the information realm. In an everyone-a-content-creator-world, who can tell which information is trustworthy? It’s easy to author and distribute news and commentary – and equally easy to monitor and censor that content. Amid these tensions, the risk is that, rather than engaging, people simply disconnect – and movements lose their mass. The challenge: Can we imagine a new, self-correcting information marketplace – an ecosystem for news and knowledge that effectively responds to, or even anticipates, whatever change happens? That ensures sustainable full information citizenship? Looks to be an exciting, invigorating event. Hope you can join us. • I’ll be co-hosting the power-packed Move the Needle bootcamp Monday at 9 am with Sloane Berrent.